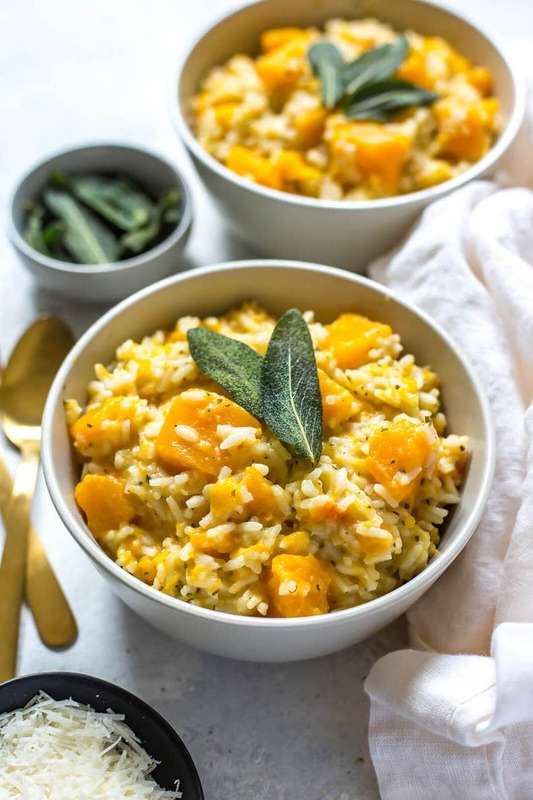 This Instant Pot Butternut Squash Risotto is a delicious, flavourful take on a fall risotto with crispy sage, shallots and garlic in a creamy parmesan broth. It's also a way to make risotto with no hands on cooking time in one pot! I cannot believe we are right in the heart of fall! I think it's my actually my FAVE season, and that's probably due to all the delicious food! I just love cozy sweater season, big bowls of soup at night, all the shows back on TV and everyone getting back into a routine…there's just something so comforting about fall. And don't get me started on all the butternut squash and pumpkin we get to eat. Yeah, I'm that kinda white girl basic LOL! Before we get started, you can check out my other fave butternut squash recipes here. 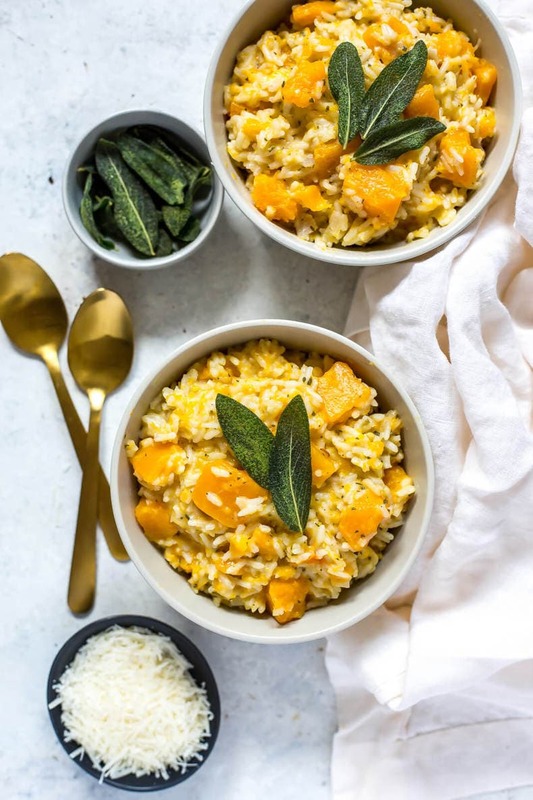 But for real though, I think the whole squash and sage combo is my favourite type of food to eat in the fall (other than this curried butternut squash lentil dal of course). I'll take any excuse I can get to indulge. And when I was dreaming up some fall recipes back in the summer to post to the blog a couple months later, I definitely knew I had to do risotto. 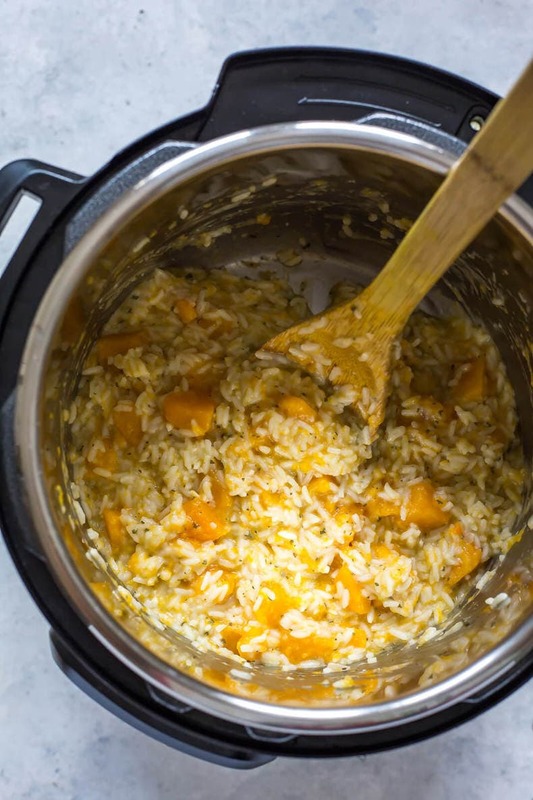 It's the best way to take those two flavours, combine it with some hearty rice and indulgent parmesan cheese AND use the Instant Pot to turn it into a one pot recipe! 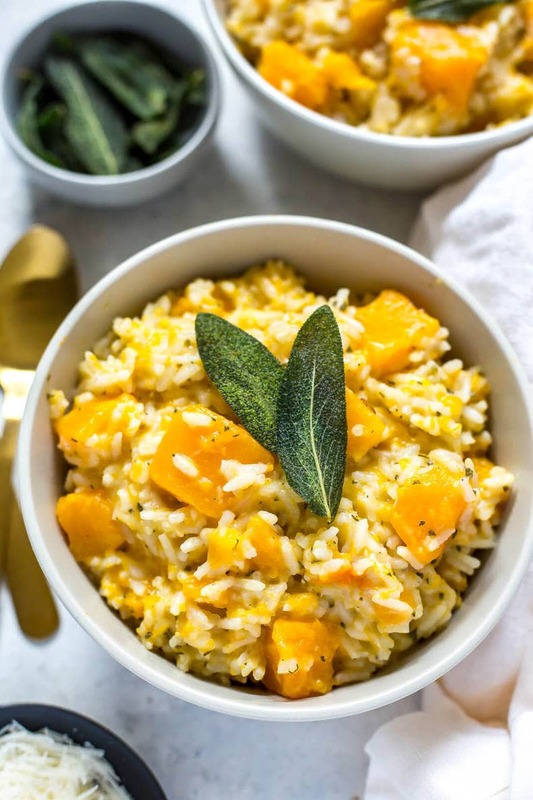 I'm not going to lie, I actually kept pushing off making and testing this Butternut Squash Risotto because I usually shoot at least two months in advance for the blog and planned to initially put this out mid-September, meaning I was initially going to shoot it in July. Needless to say I was all about corn, tomatoes and zucchini in July and had no thoughts of fall or root vegetables that time of year hahaha. 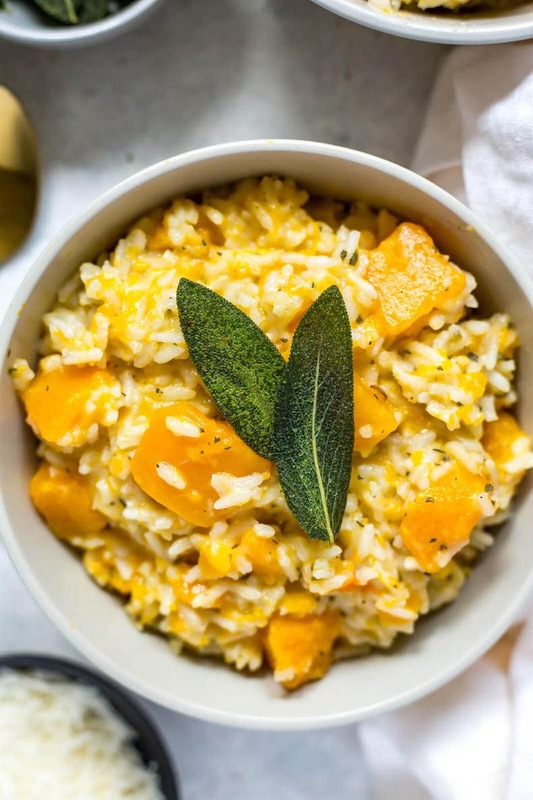 Come end of August though I felt a little pull for soup season and pasta bakes and all the delicious things that come with cooler weather and when I did make this Butternut Squash Risotto, I was pleasantly surprised with how amazing it turned out! And honestly, I'm not even trying to be cocky here! I think this basically has a lot to do with the fact that I never thought a risotto could turn out so well in the Instant Pot, and technically this is not a *true* risotto because it's not using the traditional arborio rice but it's so creamy and luxurious that taste-wise you basically can't tell the difference. 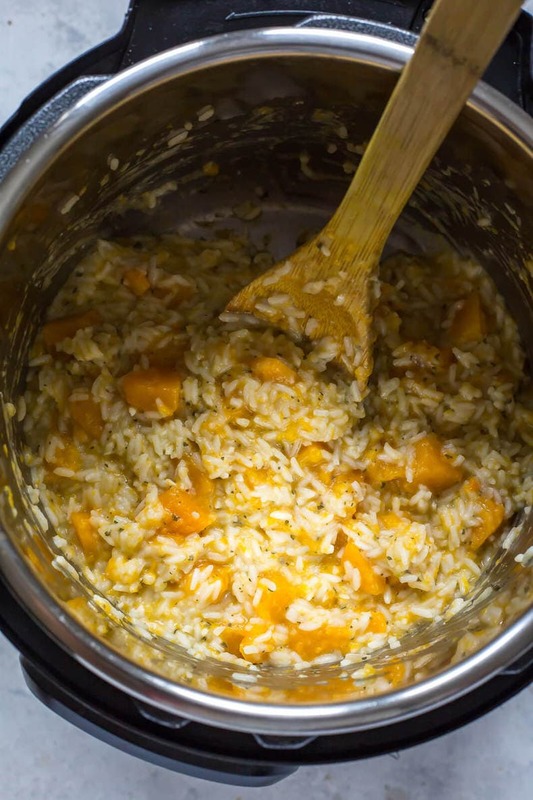 We are using almost all of the same ingredients though (minus the wine, I read that alcohol is a no bueno in the Instant Pot womp womp) so you still end up with a delicious loaded butternut squash rice dish that mimics risotto almost perfectly! 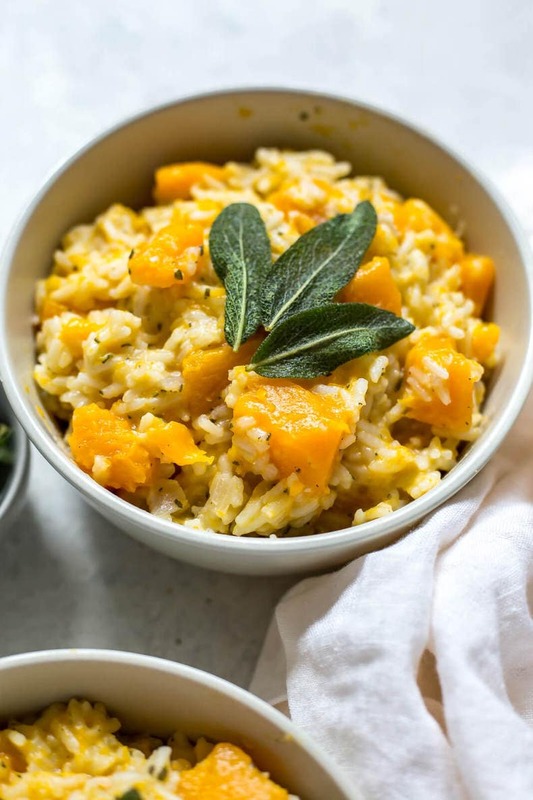 What I do really like about making this Butternut Squash Risotto in the Instant Pot is how quickly it comes together and that you don't need to do a whole bunch of extra steps like roasting the squash in the oven. This is a dump dinner through and through. 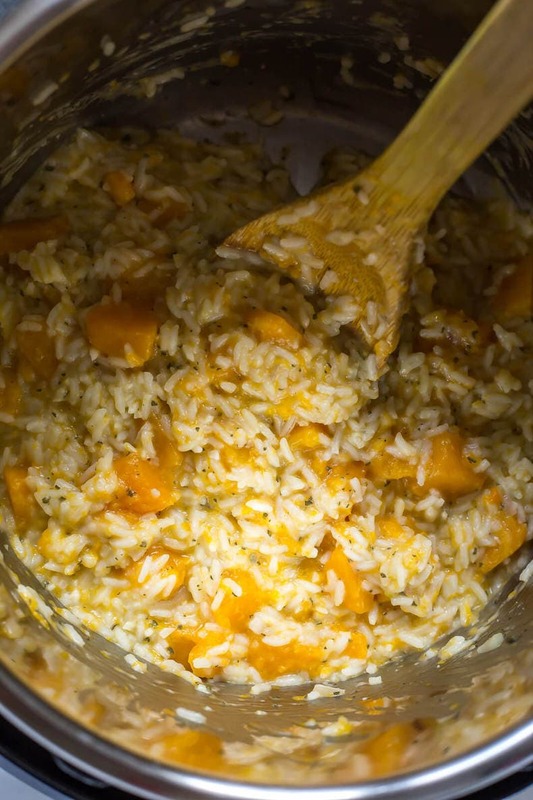 You don't even need to saute the shallots and onions ahead of time either – I find they caramelize and get mixed in with the rice brilliantly and the squash also cooks perfectly too! Just make sure you are cutting the squash into 1-inch pieces and not smaller just because the squash will be a bit mushy as you go to mix everything around already and you don't want it liquifying. First off, you want to make sure you have the right ratio of rice to liquid and squash. I found a small butternut squash worked perfectly and yielded the two cups that I needed but you could probably get away with using 3 cups of squash, which would account for a larger squash. It does cook down quite a bit so as long as you are ok with lots of squash it's fine! In terms of the rice, I just used white rice for the Instant Pot method – 1 cup to 1 and 3/4 worth of broth is what works best for this risotto, resulting in a creamy rice that isn't too liquidy. You also want to make sure you are using lots of garlic and shallots, not onions, to get a really rich flavour. 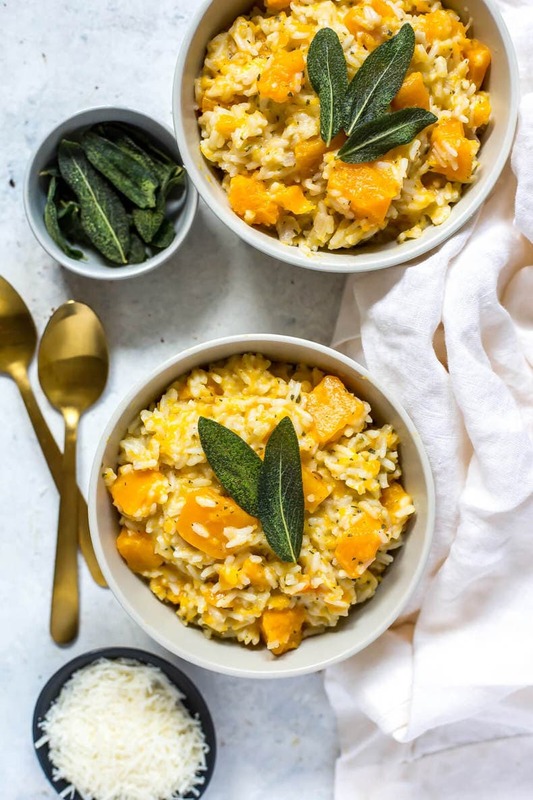 You can of course try onions in a pinch but I really do advocate for the under-used shallot – it makes a ton of difference in terms of getting that powerful onion flavour coming through and enriching this butternut squash risotto. Freshly grated parmesan cheese is also key – do NOT use that powdered stuff because it just won't turn out the same. From there it's just about nailing the crispy sage. Technically you don't need to do this if you're low on time because there is sage in the actual risotto itself, but I just love this as a finisher and it looks so pretty too! And just TRY not to eat the crispy sage as you're making this recipe, it's so addictive…almost like chips!!! 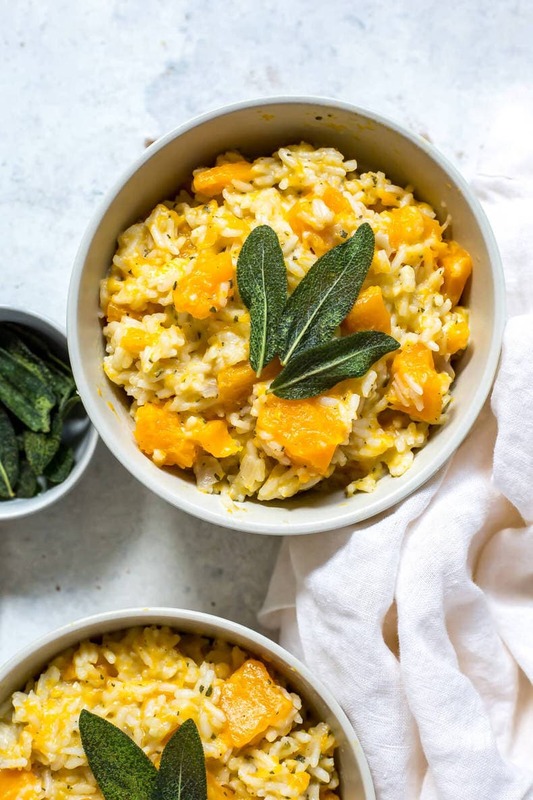 Will you be making this Instant Pot Butternut Squash Risotto? It is SO delicious and the perfect way to ring in fall! Add butter, garlic, shallots, sage, butternut squash, chicken broth, and rice to Instant Pot in that order. Cook on high pressure for 3 minutes then do a quick release of the pressure. While risotto is cooking, melt butter in a small frying pan over medium-high heat and add sage leaves in a single row. While risotto is cooking, melt butter in a small frying pan over medium-high heat and add sage leaves in a single row once butter starts bubbling. Cook for 15-30 seconds until leaves crisp up then drain on a paper towel lined plate. Set aside. Remove lid when safe to do so and stir in parmesan cheese. Divide risotto among four bowls then top each with two crispy sage leaves. Serve and enjoy! You say that wine is a no-no, then I see it in the ingredients list. I do not see it in the directions. Did I miss something? Do I add the wine at the end or leave it out entirely? Hey Roxcy, I don’t see it anywhere in the ingredient list! Maybe you misread “dry white rice”? Sorry Jesse I’m not sure what you mean! If you’re looking for cook time, it is listed as 3 minutes in the instructions. Can I use vegetable broth to make it vegetarian? Or will that change it too much? Yes you definitely can Kris! It shouldn’t change the flavour too much at all! I followed the recipe exactly, but the rice on top wasn’t cooked at all in 3 minutes. Probably because it wasn’t submerged in the liquid? I added more liquid, stirred, and put it back in for 2 more minutes. Hope it works out. Hey Em – it is a tricky balance ensuring the rice is mostly submerged under the liquid. It should be sitting on top of the other ingredients but still as close to being under the liquid as possible. Sometimes letting the rice sit with the other hot ingredients for 5-10 minutes also does the trick. This is a great recipe- thank you so much! I cook some scallops too and it’s one of our favorite meals!